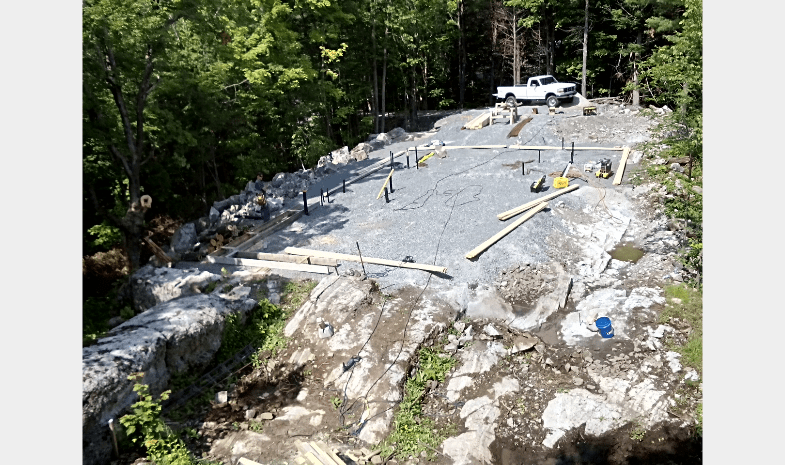 Sweetfern Update: Red Tape Cleared, Now Up She Goes! That only took forever! Infinitely longer than we expected because the process and requirements were never made clear to us. We applied for the construction permit on June 1 with the understanding that these things generally take about two weeks to be approved. And while that may not seem like a long time, it’s eternity when you have a whole crew of people who have put aside other work in order to build your house and when you have shockingly expensive construction financing that’s the just sitting there racking up interest while nothing is happening. June 1 – Submit the full application for our building permit. Package includes all the necessary documents and forms we had been instructed to include. 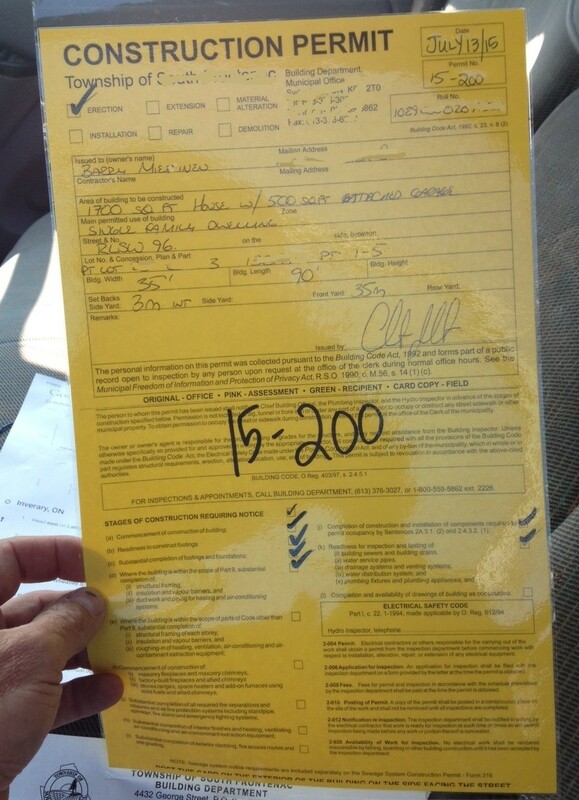 June 9 – We learn that the Permit Inspector has been out for 2 weeks and has just looked at our file. She tells us a Site Plan Agreement needs to be filed with our our permit. This is the first anyone has ever mentioned this. June 10 — Our architects ask the Permit Inspector about the Site Plan Agreement. We learn that the Head Planner has to draw it up for the a fee of $200. Then it has to be signed by the Mayor and Clerk, then sent to our lawyer who has to register it against the title of the property. Once that’s done, we have to send proof the register back to the Head Planner who will then sign off his portion of the building permit. June 16 — We learn that the Mayor and Clerk will only review the Site Plan Agreement at the monthly Township council meeting. We just missed the June meeting! The next scheduled meeting is on July 7. 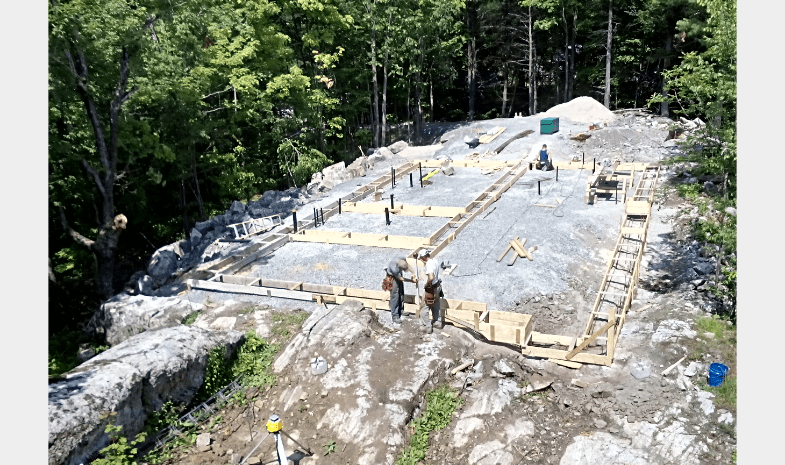 June 24 — The Chief Building Official agrees to issue a partial permit for the footings and foundation once the Mayor and Clerk sign the agreement after the July 7th Council meeting. Meanwhile, the Building Inspector will review our drawings. For the next several weeks emails fly back and forth between our architects, the Building Inspector, the Construction Manager, the engineers, and everyone else to make sure our plans meet all the requirements of the building permit. July 7 – We request that the signed Site Plan Agreement be sent as soon as it’s signed off. Our attorney needs the original copy to register. July 8 – We request the signed off Agreement be sent overnight. July 9 – The Head Planner agrees to send the original Site Plan Agreement to our attorney via same-day courier. July 10 – 09:30am – Agreement still not delivered. The Planner says he just gave it to his secretary. No idea how it was shipped. Courier confirms it’s “on the truck” and will be delivered by 6pm. July 10 – 10:30am – Delivered! July 10 – 12:27pm – We forward that to the Head Planner. But wait! There’s a matter of money. A great big pile of it, to the tune of almost $10K (!) covering the building permit and a $5100 “development charge.” This has to be paid before they issue our permit. Might have been handy if someone had mentioned that two weeks ago. Since we are 3 hours away and it’s Friday afternoon, we wire the money to our Construction Manager. PreviousAngry Birds: What’s Up With This Trumpeter Swan?